the gaunt spines of fish, among other things. a day floundering in the ocean. Ariella Carmell is a student at the University of Chicago whose writings can be found in Spry, Words Dance, The Adroit Journal, Literary Orphans, Cadaverine, Cleaver Magazine, and other publications. She is a winner of three National Scholastic Gold and Silver Medals, a 2014 Foyle Commended Poet of the Year, and a 2015 and 2016 winner of the Blank Theatre Young Playwrights Festival. 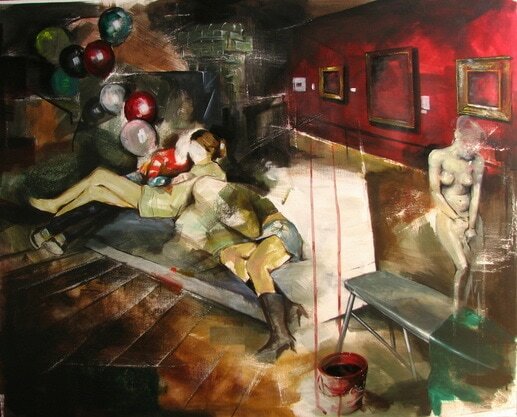 Stefan Doru Moscu is an independent Romanian artist, born in 1982. His work covers both painting and sculpture. He studied Arts and Restauration-Conservation (polychrome wood restorer) at the Faculty of History and Heritage Nicolae Lupu of Lucian Blaga University from Sibiu, 2008. Doru Moscu participated as a painter in international group exhibitions at Projectspace of Group Global 3000, "The See"/"Vom Meer", Berlin, Germany; art contest "Art Takes Times Square", New York; GLO’ART, Belgium; SIGNS OF DEXTERITY ART MARKET BERLIN; Multipoint at Oravska Galeria in Slovakia; auction house Grimberg Gallery Bucarest; "Out of the ordinary" by Multipoint International Art Symposium in Univerzum Gallery from Nitra, Slovakia; Mirela Traistaru project at ArtSafari, Bucuresti and at the MOYA - Museum of Young Art, Vienna.